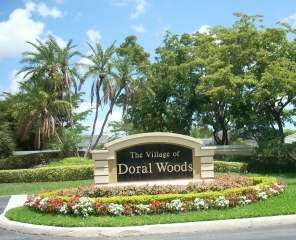 The Village of Doral Woods Association, Inc.
Our community consists of 125 townhomes and single family homes nestled in beautiful Doral Park, a planned country club community. It was built adjoining the luxurious championship Doral Silver Fox Course, a Signature golf course of the Trump National Doral. The NOTICE of the Annual Meeting of Members and Election of the 2019 Board of Directors has been mailed out. As a homeowner in a HOA, this is one of your responsiblities to exercise your right to VOTE. So please plan to attend this once-a-year event. Your Board members have been voluntarily and tirelessly working on your behalf and need your help and cooperation. If you are unable to attend, please complete and sign the attached PROXY form, give to a neighbor who plans to attend, or give to any current board member, or leave at the guardhouse in a sealed envelope addressed to the property manager. SHOW YOUR SUPPORT, VOLUNTEER IN COMMITTEES and learn more about our community! To better serve you, the Board adopted the Committee's recommendations to modify the Architectural Control Guidelines and the corresponding Architectural Modification Form (AMR). Submit an AMR for approval prior to ALL exterior modifications/painting/landscaping. The Board also adopted the Doral Woods Tree Replacement Guide Please adhere to these standards.